I have mostly covered art in Italy, and for good reason, Italy is seemingly unbeatable. Yet, there is another art tradition, whose Renaissance predates Italy’s, that might be the sole rival in classic European oil painting, and that is the Netherlands. Previously, I talked a little about Rubens (here), but today we are going a little more north. While Rembrandt was trying to retrench himself in Amsterdam’s Jewish quarter, another artist was making his mark on Dutch history. Jan Vermeer is a curious artist. Dutch, but Catholic, of moderate impact in the art market, yet remembered for his characterizations of Dutch life. In the case of Rubens we could say he is distinct from Rembrandt by his southern Flemish style, or his adherence to the Catholic faith, his vibrant colors, as opposed to Rembrandt van Rijn’s darker views, personal rather than mythological subjects, etc. But ultimately the difference between Rubens and Rembrandt is that Rubens gave the clients what they wanted, Rembrandt painted what he saw, the light of truth without the social graces to touch it up, and increasingly he displeased clients, most famously in his revolt of Claudius Silvius, originally destined for Amsterdam’s town hall. That same difference can be placed between Rembrandt and Vermeer. Vermeer knew how to paint to please his clients. 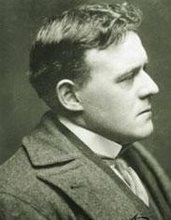 b) other artists where highly charged with political or philosophical ideas and made social and political commentary, as well as ending up in court frequently and are thus celebrated by modern art, albeit only in so much as they start the road to the collage of insanity that sells for millions in London, Paris and New York. Therefore more has been written on Rembrandt than perhaps any other artist, even more than some who have made big come-backs recently such as Caravaggio or Tiziano. So while Vermeer’s art doesn’t hit the top, it is still fascinating for the techniques he uses with his brushes to capture the idea of what he is getting across. Obscure after his death (there were bigger things to worry about for a while, as we shall see), he was rediscovered in the 19th century and ranked among the masters of the Dutch Golden Age. 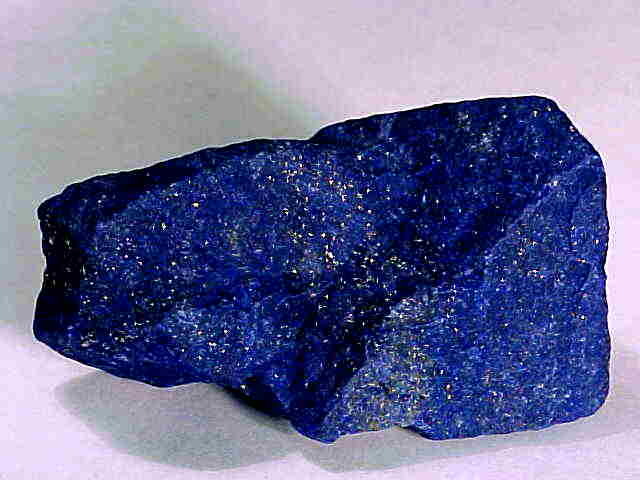 This stone, coming from Afghanistan, would be hammered down and purified into a blue pigment, and provides for the rich color blue in western art from the 14th century onwards. It is not known precisely when Vermeer was born, but we do know he was baptized in the year 1632, into the Dutch Reformed Church in the city of Delft. This suggests he was already a few years old, between 8-10 by the Calvinist practices of the time. His father was part of the St. Luke’s guild and operated an art dealing business. It is certain that Vermeer was schooled in art, for, though there is no record of his having been abroad, nevertheless in later life he was one of two men in Delft who was considered an authority to identify Italian paintings. It is not known, however, at what point he took up active painting, but he appreciated bright colors, expensive pigments like lapis lazuli, and as a member of the St. Luke’s guild himself, he was influenced by the Antwerp school of art (Rubens, Caravaggio, etc.). It is perhaps Rubens’ influence that accounts for Vermeer’s use of bright colors, and the influence of Caravaggio’s works that accounts for Vermeer’s use of light and shadow. Yet, like Rubens, Vermeer takes what he found useful from other artists without becoming slavishly devoted to that style, like the networks of Caravaggisti. What Vermeer does well is the sacredness of ordinary things, which is fully within the Dutch spirit. Holland’s art market at that time was an anomaly when considered in the context of the west of Europe. Normally painting was the provenance of the wealthy, and the trend was for artists to be increasingly noble, or at least seek knighthoods and honors. Baglione, the great rival of Caravaggio, was awarded a golden chain for his talents and was highly respected in his time (except of course, by Caravaggio). Bernini was made a Papal Knight, while his rival Borromini was made a knight of the Holy Cross. Valesquez was knighted by Philip IV of Spain, as was Rubens, who was also knighted by Charles I of England. Rubens’ pupil and later colleague, Van Dyck, was knighted by Charles I, and Jan Breughal, the son of Peter Breughal, received a title of nobility. The trend was nobility, the clients of artists were nobility, the Church, and though there was great competition for artwork, the majority of works were meant for the public to see in a set place, like a Church, to be the focal point of the community, centered around religion. The problem of the nascent Dutch Republic is that it had no public religion. The great Churches were defaced, and they did not want art in their Churches, because that was to them idolatry. But, of every day things? Thus the Dutch began a celebration of their culture, which was at its height as a world power, and whose navy easily outnumbered Spain, France and England’s navy combined. The order of the day was to celebrate Dutch culture, but the problem was the number of artists far exceeded the demand, so figures like Frans Hals, or Rembrandt had their boom moments when people could not get enough of them, and their bust moments when people had seen enough. So what about Vermeer? Vermeer married a Catholic girl in Delft named Catarina Bolnes in 1653. Her mother Maria Thins required of Vermeer that he become Catholic in order to marry her, and he did so. It is not entirely clear if at first he converted out of conviction or for the girl, but what is certainly clear is that once he had done so he became quite serious, and his art shows this in many ways. His new mother-in law was also considerably wealthier than Vermeer, allowing him the freedom to paint in exchange for a little work in her business. It is often thought that Vermeer painted for the schuilkerk, or secret Church, which was not far from his home in Delft and was run by the Jesuits. Much is made of the Dutch Republic’s famous ‘religious toleration”, but in point of fact it was a sporadic and uneven, depending upon the province. So while Haarlem offered full religious toleration, Amsterdam and Delft were more restrictive. The Mass was illegal in Amsterdam, for example, until the 19th century, but tolerated since a majority of the city’s population was Catholic well into the 17th century. 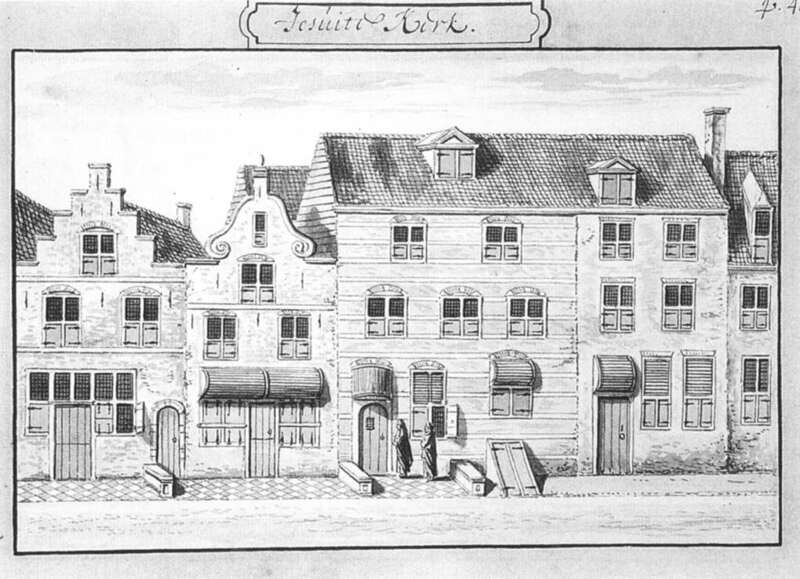 Thus one famous schuilkerk was the Ons’ Lieve Herr op Solder (Our Lord in the attic), which served Catholics for 200 years. Delft was no different. 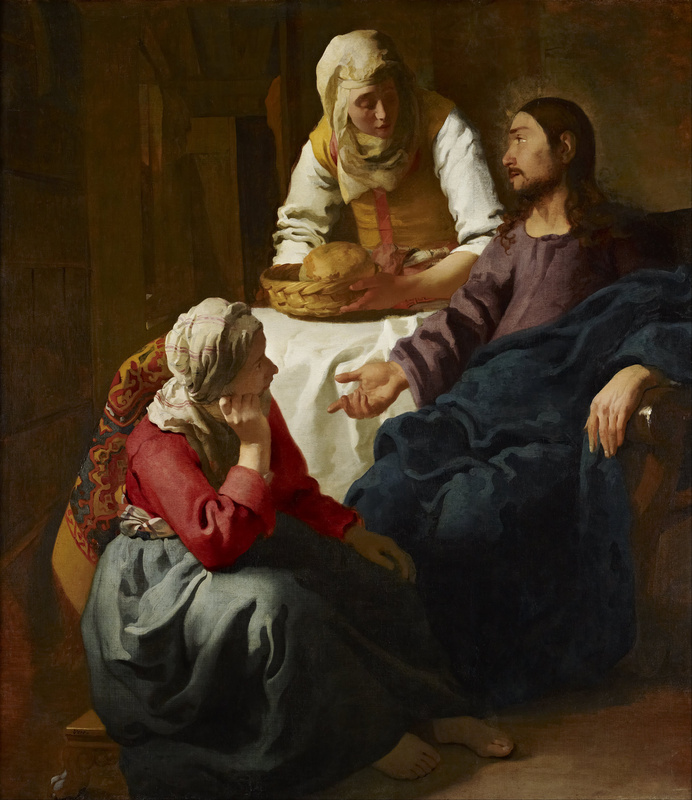 Christ in the House of Martha and Mary was painted in 1655-56, shortly after he was married. 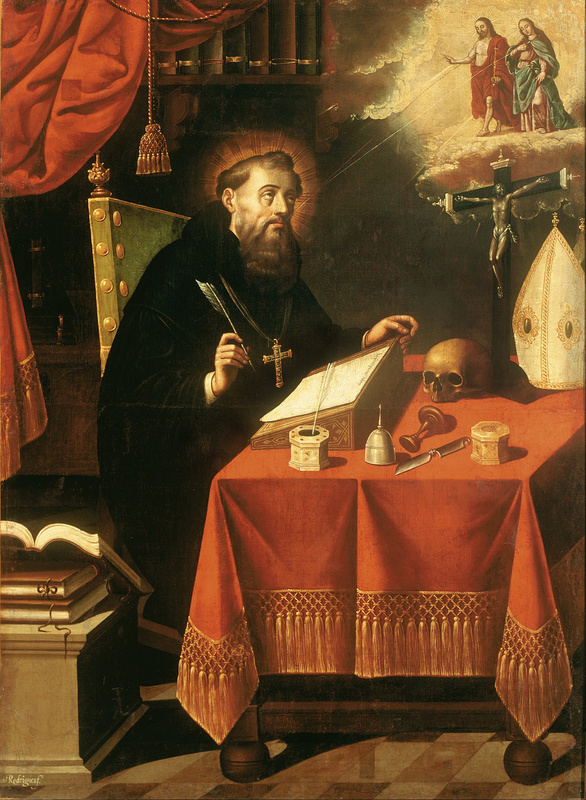 It is one of the earliest works to survive, and it is his only painting that is overtly on a religious theme. (In the future we’ll look at some other ones that recall biblical themes). The circumstances of the painting are not known, but it is thought to have been commissioned for a Church, possibly the schuilkerk in Delft. It is now in the National Gallery in Edinburg, Scotland. Christ in the house of Martha and Mary -TintorettoThe thrust here shows Martha rebuking Mary, as opposed to Vermeer’s image of the two working together. One of the things we see is the placement of the characters. We have the conforming of the biblical narrative, with Christ seated and Mary Magdalene at his feet, but what is unique about this piece is Martha’s placement. Older images of this scene show Martha a pace or two back, calling out for Mary Magdalene to do something. This takes a different approach, and Vermeer shows off his theological sophistication. Martha is not here voicing her complaint about Mary’s seeming inaction, when in fact she is in contemplation of Christ. Instead Martha is assisting and contributing to Mary’s action. The placement of Martha next to Mary and Our Lord is meant to show the unity of Faith and Works, with Mary representing the former and Margaret the latter. The reason older artists treating this scene, particularly in the Italian renaissance, would not have considered it important to include Martha and Mary together was that the reformation hadn’t happened, or else wasn’t an issue (or you took the other view, such as in anti-papal Venice). Tintoretto’s Martha rebukes Mary, while Vermeer, a Catholic living in a country where Catholicism is against the law, and the official view of the majority of those in government, as well as in Delft, a Calvinist town has the false notion of faith and works to contend with. The Dutch cultural scene emphasizes work, but outside of its context of faith. Vermeer draws a complete union between the two, as culminating in the blessed Sacrament. Look at that loaf of bread. This is not just the fruit of windmills grinding flour, this is a symbol of the Eucharist, as the fruit of faith and works. Notice the lines of symmetry, a technique from Italian baroque painting that Vermeer employs several times. 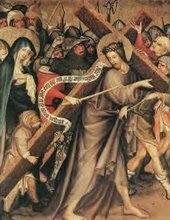 If we follow diagonally from the bottom left, we arrive at Christ’s hand, which is in many ways the key to the painting, since it occupies the central place if we draw a diagonal line from any side. Yet here should begin from the left, for in doing so we come not merely to Christ’s hand, but even more to his index finger and thumb. Immediately above the these two fingers we find the bread. 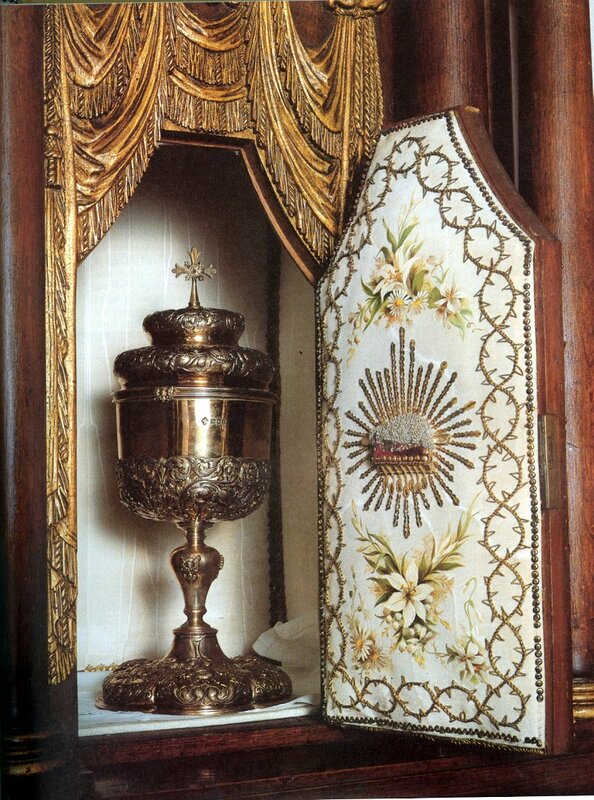 These are also a priest’s consecration fingers, and so the Eucharistic symbolism could not be more clear. By faith and good works we live a life by which we can partake of the Eucharist, which is the fruit of a work, united to faith, effected by Christ acting in the person of the priest. While our Lord is depicted in traditional Holy Land attire, Martha and Mary are dressed like Dutch maidens, one who could be expected to embroider in the parlor, and the other working in the kitchen. It is a device to merge the ancient with the modern into one fabric, that Christ is relevant today, or, we might say contrary to certain churchman, the Gospel is relevant today. It might also be a criticism of others who name their home “St. Martha’s” to emphasize works over faith, as certain people today do, though we won’t name them. Thus, a commentary on faith and works is set perfectly in the context of Dutch art of the golden age. 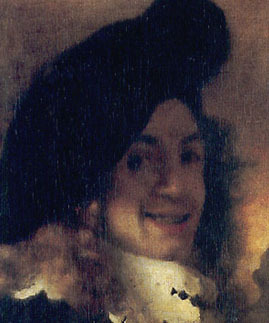 Vermeer had limited success and seems to have been happy to work for a limited number of clients. In 1672 he went mad, and his life went down hill, until he at last died in 1675, leaving his wife and children with debts. Immediately he was more or less forgotten, until the 19th century when he was rediscovered. Part of the reason for this, and why he went mad in 1672, is because that year was the catastrophic year for the Dutch Republic, which was a world-wide empire. The French and English signed the treaty of Dover (although it was secret in England), by which Charles II promised to help Louis XIV at sea, and convert to Catholicism, while Louis supplied him a subsidy and invaded the Dutch Provinces. William of Orange ordered all of the dykes and levies broken, so that the ocean would flood the countryside and halt the advance of the Dutch troops. It did that, but at a cost. Fortunes and livelihoods were ruined, Vermeer’s savings were wiped out, and even his mother-in-law was going down financially, as were many people all over the country. Thus in the aftermath in 1675, the Dutch had forgotten about many more recent painters, as they were trying to survive the tragedy. We will look more at Vermeer in the future. 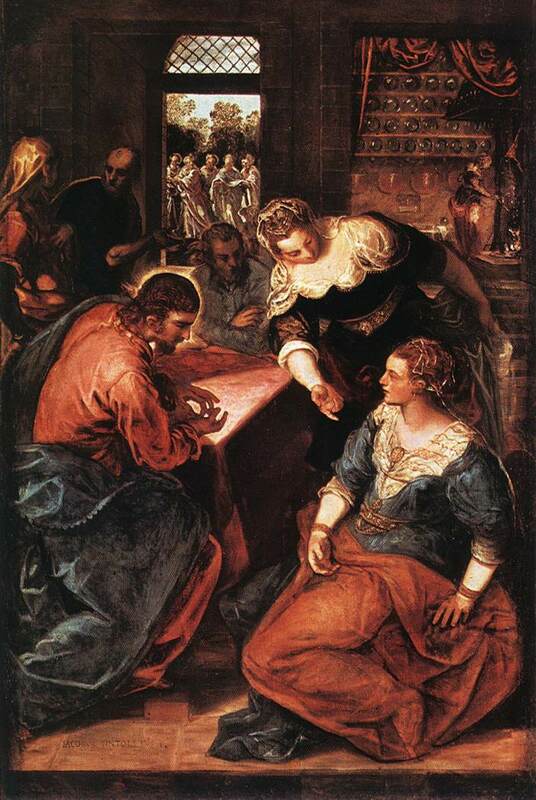 This entry was posted in Art and tagged christian art, Dutch golden age, Eucharist, faith, history, Martha and Mary, Rembrandt, sacraments, Theology, Vermeer on 3 October, 2014 by rubens7.